Like other NoSQL technologies, both Membase and CouchDB are built from the ground up on a highly distributed architecture, with data shared across machines in a cluster. Built around the Memcached protocol, Membase provides an easy migration to existing Memcached users who want to add persistence, sharding and fault resilience on their familiar Memcached model. On the other hand, CouchDB provides first class support for storing JSON documents as well as a simple RESTful API to access them. Underneath, CouchDB also has a highly tuned storage engine that is optimized for both update transaction as well as query processing. Taking the best of both technologies, Membase is well-positioned in the NoSQL marketplace. For read, Couchbase provides a key-based lookup mechanism where the client is expected to provide the key, and only the server hosting the data (with that key) will be contacted. Couchbase also provides a query mechanism to retrieve data where the client provides a query (for example, range based on some secondary key) as well as the view (basically the index). The query will be broadcasted to all servers in the cluster and the result will be merged and sent back to the client. For write, Couchbase provides a key-based update mechanism where the client sends an updated document with the key (as doc id). When handling writes request, the server will return to client’s write request as soon as the data is stored in RAM on the active server, which offers the lowest latency for write requests. In Couchbase, document is the unit of manipulation. unlike other document oriented DB, Couchbase doesn't support field-level modification. document back to the server. Couchbase currently doesn't support bulk modification based on a condition matching. Modification happens only in a per document basis. (client will save the modified document one at a time). When the client retrieves a document, a CAS ID (equivalent to a revision number) is attached to it. While the client is manipulating the retrieved document locally, another client may modify this document. When this happens, the CAS ID of the document at the server will be incremented. Now, when the original client submits its modification to the server, it can attach the original CAS ID in its request. The server will verify this ID with the actual ID on the server. If they differ, the document has been updated in between and the server will not apply the update. The original client will re-read the document (which now has a newer ID) and re-submit its modification. In a typical setting, a Couchbase DB resides in a server cluster involving multiple machines. The client library will connect to the appropriate servers to access the data. 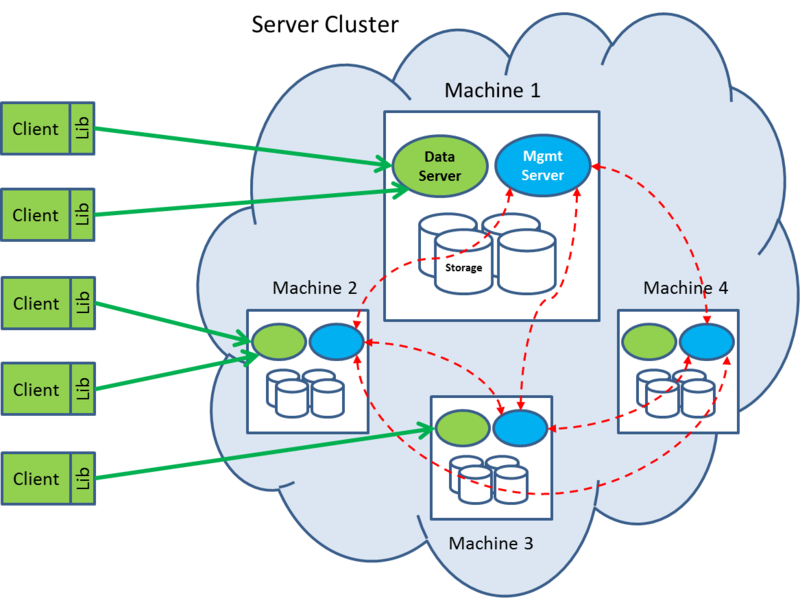 Each machine contains a number of daemon processes which provides data access as well as management functions. The data server, written in C/C++, is responsible to handle get/set/delete request from the client. The Management server, written in Erlang, is responsible to handle the query traffic from the client, as well as manage the configuration and communicate with other member nodes in the cluster. The basic unit of data storage in Couchbase DB is a JSON document (or primitive data type such as int and byte array) which is associated with a key. 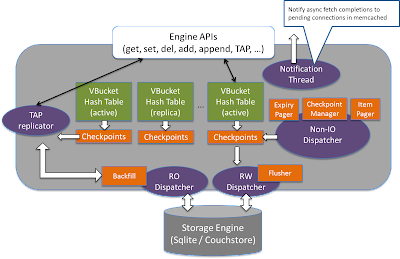 The overall key space is partitioned into 1024 logical storage unit called “virtual buckets” (or vBucket). vBucket is distributed across machines within the cluster via a map that is shared among servers in the cluster as well as the client library. High availability is achieved through data replication at the vBucket level. Currently, Couchbase supports one active vBucket zero or more standby replicas hosted on other machines. Currently, the standby server is idle and not serving any client request. In the future version of Couchbase, the standby replica will be able to serve read request. When machines are added and removed from the cluster. The administrator can request a redistribution of vBucket so that data are evenly spread across physical machines. Heartbeat: A watchdog process periodically communicates with all member nodes within the same cluster to provide Couchbase Server health updates. Process monitor: This subsystem monitors the execution of the local data manager, restarting failed processes as required and provide status information to the heartbeat module. Configuration manager: Each Couchbase Server node shares a cluster-wide configuration which contains the member nodes within the cluster, a vBucket map. The configuration manager pulls this config from other member nodes at bootup time. If the leader node crashes, a new leader will be elected from surviving members in the cluster. When a machine in the cluster has crashed, the leader will detect that and notify member machines in the cluster that all vBuckets hosted in the crashed machine are dead. After getting this signal, machines hosting the corresponding vBucket replica will set the vBucket status as “active”. The vBucket/server map is updated and eventually propagated to the client lib. Notice that at this moment, the replication level of the vBucket will be reduced. Couchbase doesn’t automatically re-create new replicas which will cause data copying traffic. An administrator can issue a command to explicitly initiate a data rebalancing. The crashed machine after reboot can rejoin the cluster. At this moment, all the data it stores previously will be completely discarded and the machine will be treated as a brand new empty machine. As more machines are put into the cluster (for scaling out), vBucket should be redistributed to achieve a load balance. This is currently triggered by an explicit command from the administrator. Once receive the “rebalance” command, the leader will compute the new provisional map which has the balanced distribution of vBuckets and sends this provisional map to all members of the cluster. Evenly distribute the number of active vBuckets and replica vBuckets among member nodes. Place the active copy and each replica in physically separated nodes. Spread the replica vBucket as wide as possible among other member nodes. Orchestrate the steps of replica redistribution so no node or network will be overwhelmed by the replica migration. 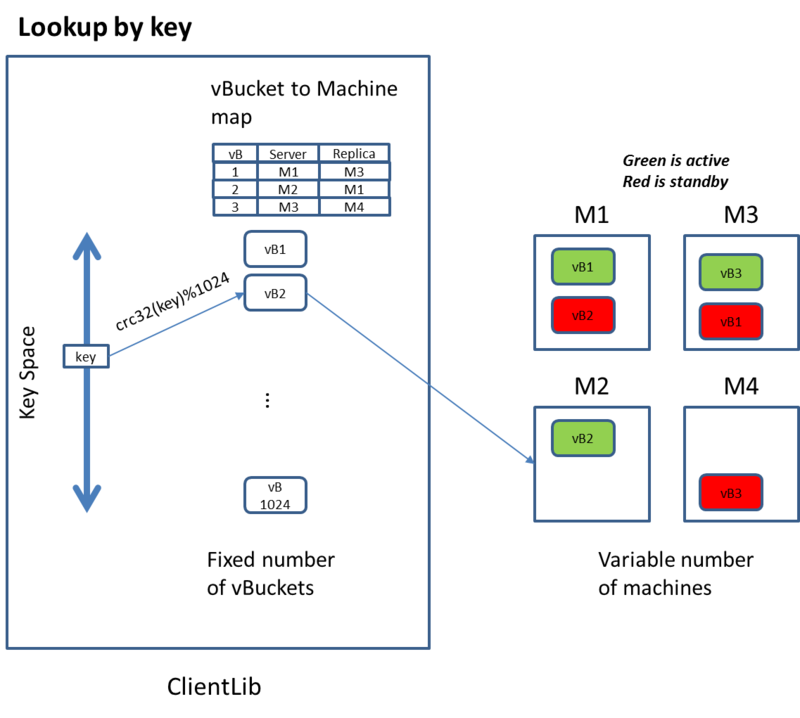 Once the vBucket maps are determined, the leader will pass the redistribution map to each member in the cluster and coordinate the steps of vBucket migration. The actual data transfer happens directly between the origination node to the destination node. Notice that since we have generally more vBuckets than machines. The workload of migration will be evenly distributed automatically. For example, when new machines are added into the clusters, all existing machines will migrate some portion of its vBucket to the new machines. There is no single bottleneck in the cluster. “Replica”: means the server is hosting a copy of the vBucket that may be slightly out of date but can take read request that can tolerate some degree of outdated. “Pending”: means the server is hosting a copy that is in a critical transitional state. The server cannot take either read or write request at this moment. “Dead”: means the server is no longer responsible for the vBucket and will not take either read or write request anymore. One in-memory hashtable (key by doc id) for the corresponding vBucket hosted. The hashtable acts as both a metadata for all documents as well as a cache for the document content. Maintain the entry gives a quick way to detect whether the document exists on disk. To support async write, there is a checkpoint linked list per vBucket holding the doc id of modified documents that haven’t been flushed to disk or replicated to the replica. Data server routes the request to the corresponding ep-engine responsible for the vBucket. The ep-engine will lookup the document id from the in-memory hash table. If the document content is found in the cache (stored in the value of the hash table), it will be returned. Otherwise, a background disk fetch task will be created and queued into the RO dispatcher queue. The RO dispatcher then reads the value from the underlying storage engine and populates the corresponding entry in the vbucket hash table. Finally, the notification thread notifies the disk to fetch completion to the Memcached pending connection, so that the Memcached worker thread can revisit the engine to process a get request. To handle a “SET” request, a success response will be returned to the calling client once the updated document has been put into the in-memory hash table with a write request put into the checkpoint buffer. Later on, the Flusher thread will pick up the outstanding write request from each checkpoint buffer, lookup the corresponding document content from the hashtable and write it out to the storage engine. Of course, data can be lost if the server crashes before the data has been replicated to another server and/or persisted. If the client requires a high data availability across different crashes, it can issue a subsequent observe() call which blocks on the condition that the server persists data on disk, or the server has replicated the data to another server (and get its ACK). Overall speaking, the client has various options to tradeoff data integrity with throughput. Hashtable Management To synchronize accesses to a vbucket hash table, each incoming thread needs to acquire a lock before accessing a key region of the hash table. There are multiple locks per vbucket hash table, each of which is responsible for controlling exclusive accesses to a certain ket region on that hash table. The number of regions of a hash table can grow dynamically as more documents are inserted into the hash table. To control the memory size of the hashtable, Item pager thread will monitor the memory utilization of the hashtable. Once a high watermark is reached, it will initiate an eviction process to remove certain document content from the hashtable. Only entries that are not referenced by entries in the checkpoint buffer can be evicted because otherwise the outstanding update (which only exists in hashtable but not persisted) will be lost. After the eviction, the entry of the document still remains in the hash table; only the document content of the document will be removed from memory but the metadata is still there. The eviction process stops after reaching the low watermark. The high/low water mark is determined by the bucket memory quota. By default, the high water mark is set to 75% of bucket quota, while the low water mark is set to 60% of bucket quota. These watermarks can be configurable at runtime. In CouchDB, every document is associated with an expiration time and will be deleted once it is expired. Expiry pager is responsible for tracking and removing the expired document from both the hashtable as well as the storage engine (by scheduling a delete operation). Checkpoint manager is responsible to recycle the checkpoint buffer, which holds the outstanding update request, consumed by the two downstream processes, Flusher, and TAP replicator. When all the request in the checkpoint buffer has been processed, the checkpoint buffer will be deleted and a new one will be created. TAP replicator is responsible to handle vBucket migration as well as vBucket replication from active server to replica server. It does this by propagating the latest modified document to the corresponding replica server. The in-memory hash table at the active server will be transferred to the replica server. Notice that during this period, some data may be updated and therefore the data set transferred to the replica can be inconsistent (some are the latest and some are outdated). Nevertheless, all updates happen after the start of transfer is tracked in the checkpoint buffer. Therefore, after the in-memory hashtable transferred is completed, the TAP replicator can pick up those updates from the checkpoint buffer. This ensures the latest versioned of changed documents are sent to the replica, and hence fix the inconsistency. However, the hash table cache doesn’t contain all the document content. Data also need to be read from the vBucket file and send to the replica. Notice that during this period, an update of vBucket will happen in the active server. However, since the file is appended only, subsequent data update won’t interfere the vBucket copying process. After the replica server has caught up, subsequent update at the active server will be available at its checkpoint buffer which will be pickup by the TAP replicator and send to the replica server.